Episode 179 of The Astrology Podcast features astrologers Chris Brennan and Leisa Schaim discussing the horoscopes for November of 2018 for all twelve rising zodiac signs. Chris has been doing these as monthly video horoscopes for each rising sign since July on his astrology YouTube channel, but this month Leisa joined him in our new podcast studio to record the horoscopes for November. The horoscopes complement the astrology forecast episode for November, because it allows us to delineate the ingress of Jupiter into each house when it moves into Sagittarius this month, and talk a bit about what that will mean for each rising sign. We also talk about Venus stationing direct in Libra, Mercury stationing retrograde in Sagittarius square Neptune, the two lunations in Scorpio and Gemini, and more. They came out so well this month that we decided to release an audio version as well as the video through the podcast, for those who just want to listen to the audio. Below you will find links to each of the separate videos for the horoscopes for each zodiac sign, and at the bottom of the page you will find a single file containing the audio for all 12 horoscopes as a single podcast episode. I will include some timestamps at the bottom of the page as well, that way you can jump to the specific zodiac sign that you want to listen to in the audio version. The run-time of each horoscope varies between 10-20 minutes, because we recorded all 12 over the course of a day on November 30, and had more or less to say about certain signs. This has been a bit of an experiment and a learning process over the past few months, but we’re excited to share these horoscopes with podcast listeners for the first time this month, and would love to hear what everyone thinks of them. Thanks to Paula Belluomini for creating the zodiac artwork used in the horoscopes this month, and Stephen Coppock for editing the audio and video. Check out our page on Amazon for the new astrology t-shirts that we wore in this episode. 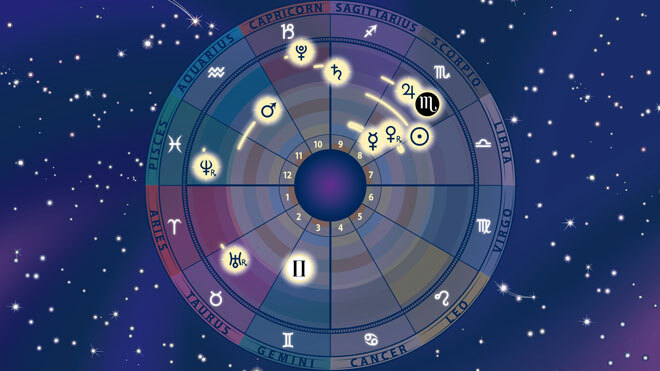 So, without further ado, here are the horoscopes for November! Your major astrology transits this month, Aries, include Jupiter moving into your 9th house of education and travel, a new Moon in your 8th house of shared resources, Uranus retrograding back into your first house of body and mind, Mars moving into your 12th house of solitude, Venus stationing direct in your 7th house of relationships, Mercury stationing retrograde in your 9th house of education, and a Full Moon in your 3rd house of communication. Your major astrology transits this month, Taurus, include Jupiter moving into your 8th house of shared resources, a new Moon in your 7th house of partnership, Uranus retrograding back into your 12th house of solitude, Mars moving into your 11th house of friends, Venus stationing direct in your 6th house of work and health, Mercury stationing retrograde in your 8th house of shared resources, and a Full Moon in your 2nd house of income. Your major astrology transits this month, Gemini, include Jupiter moving into your 7th house of partnership, a new Moon in your 6th house of work and health, Uranus retrograding back into your 11th house of friends, Mars moving into your 10th house of career, Venus stationing direct in your 5th house of children and recreation, Mercury stationing retrograde in your 7th house of partnership, and a Full Moon in your 1st house of self. Your major astrology transits this month, Cancer, include Jupiter moving into your 6th house of work and health, a new Moon in your 5th house of recreation and children, Uranus retrograding back into your 10th house of career, Mars moving into your 9th house of travel and education, Venus stationing direct in your 4th house of home and family, Mercury stationing retrograde in your 6th house of work and health, and a Full Moon in your 12th house of solitude. Your major astrology transits this month, Leo, include Jupiter moving into your 5th house of recreation and children, a new Moon in your 4th house of home and family, Uranus retrograding back into your 9th house of travel and education, Mars moving into your 8th house of shared resources, Venus stationing direct in your 3rd house of communication, Mercury stationing retrograde in your 5th house of recreation and children, and a Full Moon in your 11th house of friends. Your major astrology transits this month, Virgo, include Jupiter moving into your 4th house of home and family, a new Moon in your 3rd house of communication, Uranus retrograding back into your 8th house of shared resources, Mars moving into your 7th house of partnership, Venus stationing direct in your 2nd house of income, Mercury stationing retrograde in your 4th house of home and family, and a Full Moon in your 10th house of career. Your major astrology transits this month, Libra, include Jupiter moving into your 3rd house of communication, a new Moon in your 2nd house of income, Uranus retrograding back into your 7th house of partnership, Mars moving into your 6th house of work and health, Venus stationing direct in your 1st house of self, Mercury stationing retrograde in your 3rd house of communication, and a Full Moon in your 9th house of travel and education. Your major astrology transits this month, Scorpio, include Jupiter moving into your 2nd house of income, a new Moon in your 1st house of self, Uranus retrograding back into your 6th house of work and health, Mars moving into your 5th house of recreation and children, Venus stationing direct in your 12th house of solitude, Mercury stationing retrograde in your 2nd house of income, and a Full Moon in your 8th house of shared resources. Your major astrology transits this month, Sagittarius, include Jupiter moving into your 1st house of self, a new Moon in your 12th house of solitude, Uranus retrograding back into your 5th house of recreation and children, Mars moving into your 4th house of home and family, Venus stationing direct in your 11th house of friends, Mercury stationing retrograde in your 1st house of self, and a Full Moon in your 7th house of partnership. Your major astrology transits this month, Capricorn, include Jupiter moving into your 12th house of solitude, a new Moon in your 11th house of friends, Uranus retrograding back into your 4th house of home and family, Mars moving into your 3rd house of communication, Venus stationing direct in your 10th house of career, Mercury stationing retrograde in your 12th house of solitude, and a Full Moon in your 6th house of work and health. Your major astrology transits this month, Aquarius, include Jupiter moving into your 11th house of friends, a new Moon in your 10th house of career, Uranus retrograding back into your 3rd house of communication, Mars moving into your 2nd house of income, Venus stationing direct in your 9th house of travel and education, Mercury stationing retrograde in your 11th house of friends, and a Full Moon in your 5th house of recreation and children. Your major astrology transits this month, Pisces, include Jupiter moving into your 10th house of career, a new Moon in your 9th house of travel and education, Uranus retrograding back into your 2nd house of income, Mars moving into your 1st house of self, Venus stationing direct in your 8th house of shared resources, Mercury stationing retrograde in your 10th house of career, and a Full Moon in your 4th house of home and family. Here are some time stamps for when each sign begins in the audio version of our November horoscopes, which you can listen to or download through the links below. Love this format. THANKS to both of you! I’m a bit confused about how to think of the houses etc based on rising or sun sign. Can you help shed some light on this? I would just look at the horoscope that matches your rising sign, and then the whole sign houses will be more or less in alignment with how one of us would interpret your chart and the ingresses normally. Should one attempt to determine whether reading the houses based on Sun or Rising sign is more accurate? Or is it generally accepted that the rising sign is the way to do it? I am a Virgo sun, Libra rising, and I get confused when I listen to both the Virgo and the Libra forecast. Should I just stick with Libra rising? Reading it relative to the rising sign is definitely more highly recommended, as long as you are pretty certain about your birth time. The delineation relative to your Sun sign may still be somewhat relevant in terms of the aspects the planets make to your Sun-sign, but our delineations focus heavily on the houses, which are mean to be measured out from the rising sign. Thanks. As a Leo rising I found that to be more accurate than for my sun sign of Taurus. Great format. I really liked the way these are presented. I think having both voices adds richer perspective. Good work! I would focus more on the houses when reading it relative to the rising sign, whereas if you are looking at it from the perspective of your Sun-sign then the aspects that the planets make to that sign would be relevant that month, especially from a sign-based perspective. Are you selling the Planet Watcher calendar and bundle for 2019? I’m in the process of getting some calendar posters for 2019 printed up now, and I should be making an announcement about them soon. Awesome, thanks! Very good co-operation/synergy in the interpretation, I personally found Lisa’s comments especially relevant for my own situation. Has anyone else found reading for a solar return ASC or progressed ASC helpful? Another way of asking this is what really is the affect of transits to these two charts? How profound compared the the natal? I just wanted to say thank you for doing these- I send them to friends who don’t really understand Astrology and these are very clear, informative looks into the month for people. Thank you for going to the effort of doing all of these.